One thing many of us forget to consider is the background in a photo. We focus (literally and figuratively) on the main subject and feel gratified that we can get the whole subject in the frame and it’s sharp and properly exposed. Let me show you an example of how easy it can be to make a significant difference in your photos. In this case, we’ll be talking about an application related to macro work and dragonfly photography. When shooting macro we generally strive to get the best depth of field (DOF) we can get. The best and perhaps the easiest way to achieve this is by increasing our f-stop. When photographing a subject like a dragonfly, generally f/11 is a good place to start with f/16 being even better . . . sometimes that is. Still can’t see it? How about now? Focusing tighter onto the subject this shot was taken at f/16. It is sharp and shows the entire dragonfly. The background is good, nicely blurred without too much definition. But can we improve on this? The hardest part in macro photography is making sure the entire subject is in focus. The camera I used was a crop sensor Canon 7D Mark II, with a Canon 100-400mm f/4.5-5.6L and a 1.4X Canon Extender (giving me a total reach of 560mm). At this focal length, depth of field (DOF) becomes problematic. At 6 feet (the approximate distance I was from this Hines Emerald) I would get 0.177” DOF at f/16. 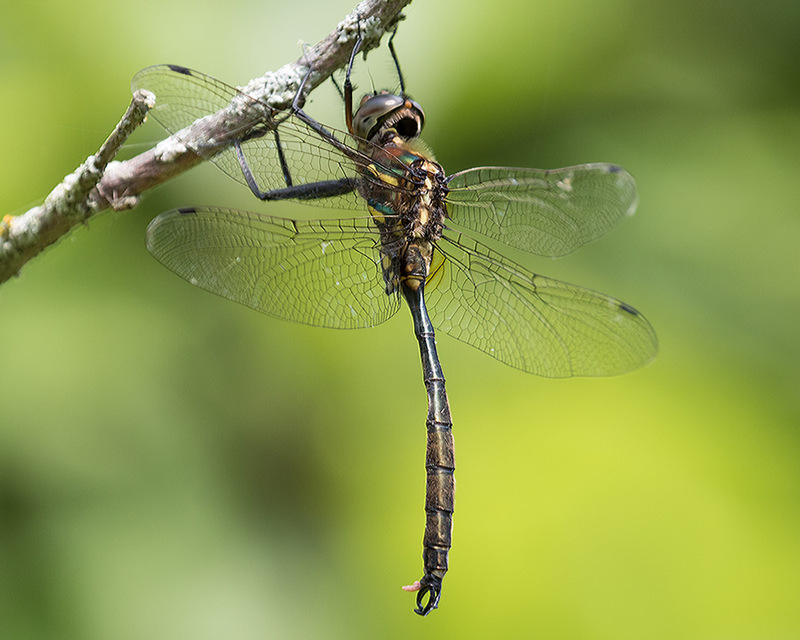 This is more than enough DOF to get the entire body of the dragonfly sharp as well as a small portion of each wing. At this point, most photographers would be happy with the result. And I would too. However, when the subject is extremely cooperative, then maybe you should try to see if you can improve on the photo. In order to do that you will need to be quick and make a good judgment on the geometrical plane of sharpness. The “plane” being that everything parallel to your camera’s sensor is sharp. This photo also shows good overall sharpness, even though the DOF was reduced to 0.089”. But, the background is greatly improved here. True, some may like the background with the f/16 shot, but my personal preference is to highlight the subject by decreasing the effect the background has on an image. One other thing to point out here is shutter speed and ISO. I intentionally left it out of the discussion because I wanted the reader’s attention on the main topic: the quality of the background and how a simple quick adjustment can make a big difference. But, both ISO and shutter speed play an important role in sharpness. The ISO I used was 400. I chose 400 because this is the overall norm I use for shooting in variable lighting conditions such as dragonfly photography. If I knew I’d be taking all my photos in bright light I may opt to use 200. But, many shots of dragonflies are taken in dim light so I usually go with 400. At 400, you’ll get reasonable amounts of noise that are controllable in post-processing. Now, onto to my thoughts on shutter speed in this situation. The shot taken at f/16 was at a shutter speed of 1/60 second. Yes, I did use a tripod and that should ensure that I get a sharp photo, right? The shot taken at f/8 was at a shutter speed of 1/250 second. Keep in mind, I did not use any remotes or lock up the mirror. In most dragonfly situations you probably won’t have the time for either. Also, just the motion of pressing down on the camera’s shutter button can result in some degree of shake, leading to focusing issues. So, even though f/8 may have been fine for overall DOF in this situation, I’m also glad that the faster shutter speed may have contributed to some degree of sharpness. The result? Just what I wanted. A sharp image showing this beautiful dragonfly against a non-conflicting background that accents that beauty. About the Author: Vic Berardi is a raptor lover that lives in the Midwest. 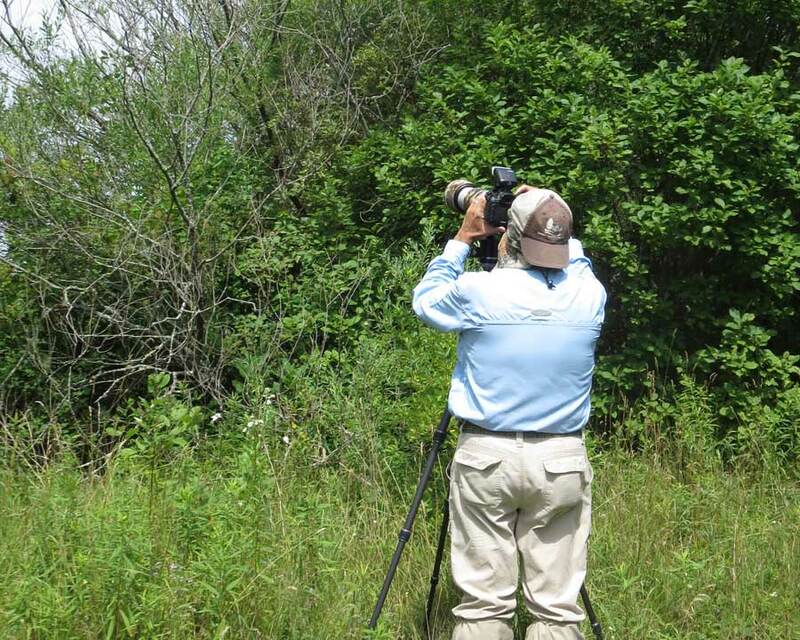 He is the founder of the Illinois Beach State Park Hawk Watch and every weekend of the year you’ll find him searching for hawks and photographing them. Several of his photographs have been published in a leading raptor journal and in articles he has written. During the year he gives presentations teaching others about hawks and hawk migration. 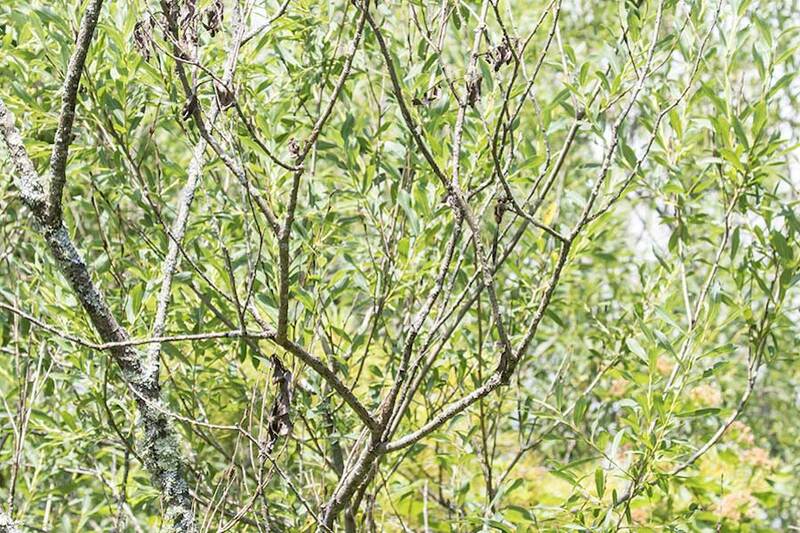 Vic also photographs dragonflies and wild flowers and is always respectful of nature and its creatures. Great artical on macro, there is always something new to learn. Love your article. 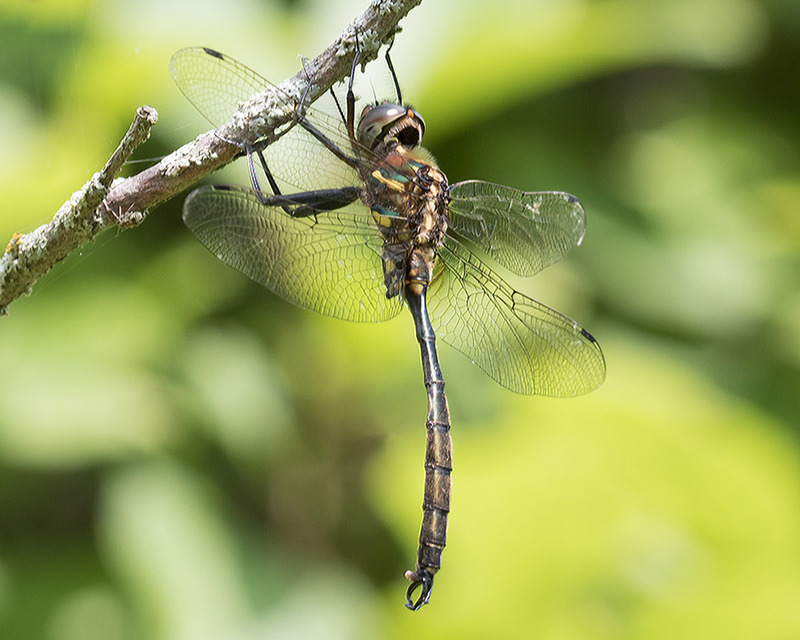 I like shooting dragonflies as well and also tracking the Berry bald eagles on Berry college campus. Very useful tutorial but what really, really boggles my mind is how you spotted anything in the first place, let alone a dragonfly, in that tangle of tree branches, at that distance. I’ve never managed a DF shot except on reed grass at the edge of a pond. Are you insanely lucky or do you have some superpower the rest of us don’t? Thank you Pat! Sometimes I do get lucky and see one land in an obscure spot but most of the time you just have to very carefully look for them in a situation like this.